Austin is currently working on a degree in music. He has studied for 2 years under Gustav Pineda. Austin has over 10 years of performance experience with bands and ensembles, both in concerts and in studio sessions. He has been teaching since 2003. Austin teaches all ages and styles, including classical, contemporary, rock, blues, funk, anime, jazz and alternative. 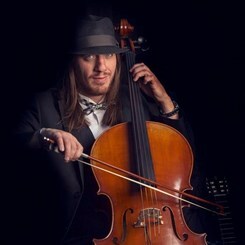 He also teaches violin, viola, cello, guitar, bass guitar, string bass and ukulele. Request Lessons with Austin today!